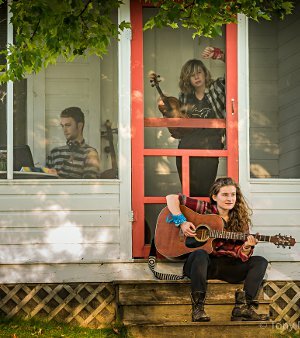 The Accidentals are used to getting shout-outs, from the likes of Billboard Magazine, music festival insiders, and, of course, the audiences who flock to their rootsy, genre-bending shows. But back home in Traverse City, where they’ve just returned from a West Coast tour swing, Savannah Buist, 20, and Katie Larson, 19, have saved up some shout-outs of their own. Like to the entire NMC music department, which last year helped Buist score one of The Accidentals’ songs for performance by the 72-piece Traverse Symphony Orchestra. A violinist herself, Buist recalls adjunct instructor Mike Hunter’s comment about her original arrangement for the horn section. “ ‘You forgot to let them breathe,’ ” she said, with a laugh. With the assistance of Hunter, Dorothy Vogel, Scott Sorenson, Laurie Sears and others, however, the Accidentals and the TSO pulled off the piece. Described by one music blogger as “the best unsigned band in America,” both Buist and Larson’s vocal resumes include singing in the NMC Children’s Choir. Larson, chiefly a cellist, recalls her nervousness at auditioning a cappella. She did it, though, and said the lesson is still relevant to the Accidentals. “The thing that has gotten us this far is pushing out of the comfort zone,” she said. After meeting at Traverse City West High School, the pair transferred to the Interlochen Center for the Arts. Buist graduated in 2013 and Larson in 2014. 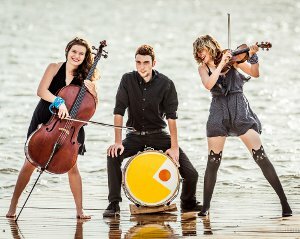 Buist then earned an Audio Technology certificate at NMC before they decided to pause their formal educations to dedicate themselves full-time to The Accidentals. On the other hand, focusing exclusively on music has paid off. “It’s been amazing to see what kind of success you get,” Larson said. At the top of their 2016 goal list is a new album. Then, they hope to return to some of the cities where their fan base is strongest. That would include Traverse City, where the love is mutual. “Anything in Traverse City has had some part in shaping who we are,” said Larson.